ARE YOU READY TO END PERFECTION PARALYSIS? Perfection paralysis— that special breed of “stuckness” that happens when we are so afraid to look dumb, fail or not be perfect that we don’t even allow ourselves to START, let alone have any fun. Whether you have a Valentine or not this year, it is time that we all learned to start loving ourselves and celebrating that love EVERY day. Self-love isn’t all heart-eyes-in-the-mirror and dancing around in your underwear. It is about self-acceptance. Self-trust. Self-respect. Self-confidence. And positive self-talk. 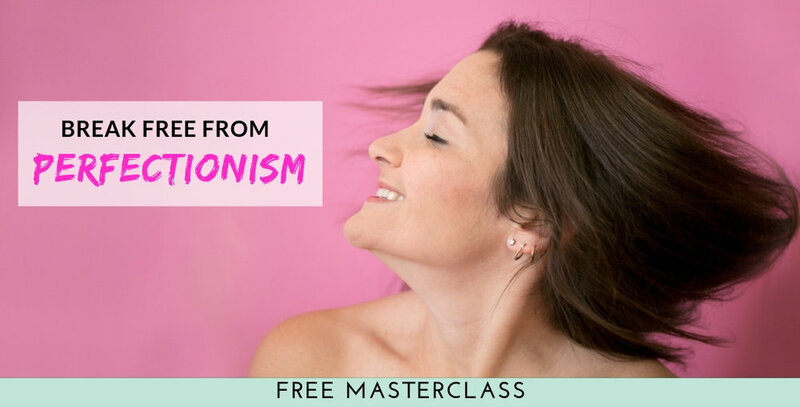 Drop your details below to download the masterclass and start ditching perfectionism… on your own time! I am so excited that you are tuning into the Break Free from Perfectionism Masterclass! Usually taking the first step takes the most courage. Check your email to confirm your participation and grab the link!